This week sees the release of the gorgeous-looking Captain America #1 by Nick Spencer and Jesus Saiz. And it will utterly change the history and very nature of Captain America. This was probably the big announcement originally planned by Marvel for yesterday in the wake of DC Universe Rebirth spoilers but it’s looking like it’s now been held back. 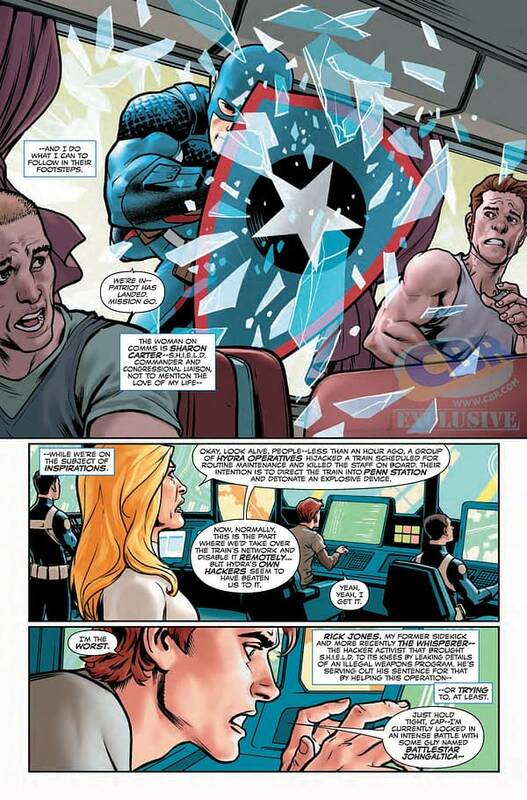 Well, it’s not the kiss with Sharon Carter, who notices how much older than Steve she now looks. Not even the liberal-left wing jibe on how unemployment is driving Hydra recruitment. Because this is the issue in which we get Nick Spencer’s The Anatomy Lesson moment.The Anatomy Lesson being the second issue of Swamp Thing by Alan Moore and Steve Bissette where it is revealed that Swamp Thing was never Alec Holland, just the memory of him, preserved in vegetable matter. Everything you knew was wrong. If you want to avoid this spoiler then consider yourself warned. DC Universe: Rebirth? That was the trial run. Marvel wins. The issue is released from Tuesday midnight in a variety of stores and timezones and in all stores from Wednesday morning. We won’t be talking about it till we have a copy in our hands bought from a comic shop. But that will probably be Forbidden Planet in London at midnight UK time, 7pm ET, 4pm PT. May I recommend you get something like SpoilerShield and add “Captain America” and “Steve Rogers” into it?